Fancy a bit of winter touring? 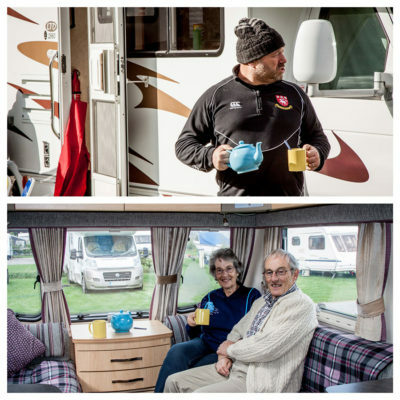 With effective heating systems there’s no reason why you shouldn’t get the most out of your caravan or motorhome and use it all-year round. Many campsites are open for longer and will probably be a lot quieter than the summer months, not to mention cheaper, making them perfect for a relaxing winter retreat. Plus more regular use will help to reduce damp and keep your outfit in good running order. Whether you plan to escape the UK for some winter sun or pitch for a staycation, here’s our hot tips on keeping warm and trouble-free, as you get ready to face the elements! Firstly, make sure you’re prepared for towing and driving in wet, windy and even snowy conditions. Watch your speed, drive with care and give yourself more time and distance for braking. Consider fitting winter tyres to your motorhome or tow vehicle but at the very least check your tyre tread and pressure. 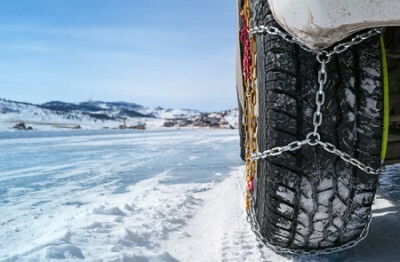 If you’re heading to the continent check the local laws as in some countries winter tyres are a legal requirement – you might also need snow chains too. Before setting off make sure you have enough fuel and check oil and water levels as well as screen wash and coolant. Also check wipers and tyres for any signs of wear and tear or damage and that all lights and controls are clean and in full working order. For those who stow their caravan or motorhome at home, hook up to the mains with an adaptor to make sure your batteries are fully charged. Keep a close eye on the traffic and weather conditions before setting off and have an emergency pack in the car of warm clothes, boots, blanket, food and drink, phone charger, ice scraper, jump leads and torch in case you get stuck. Check you’re not carrying too much weight and make sure the weight of is equally distributed for safe towing. Having the right equipment is essential before embarking on a winter trip – you’ll probably want to invest in some extra kit. Gas – Butane is more suited to milder weather and won’t work well below 5 degrees C, so in winter you’re best using propane (LPG). Also consider a gas safety check to make sure everything’s working efficiently and is safe. 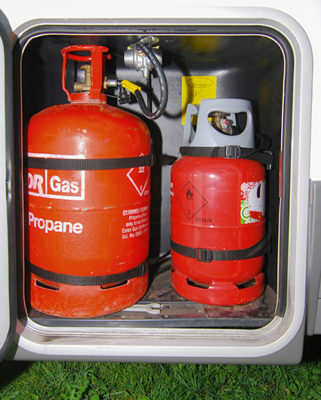 Read more about gas when touring here. 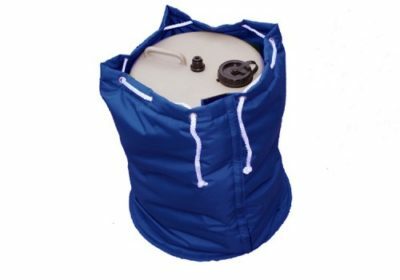 Water – Invest in an insulated water carrier cover for when the weather turns chilly and to stop your water from freezing over. Foam pipe lagging will also help to prevent external pipework from freezing. Grip mats – Pack some grip or track mats so you don’t get stuck in the mud or snow, or some old bits of carpet. 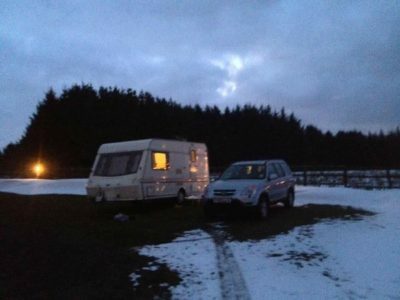 Heating – If your caravan or motorhome doesn’t have one of the latest heating systems, use a mains operated heater or oil-filled free standing radiator but we’d advise turning it off overnight or whenever leaving your ‘van unattended. Put the heating on as soon as you’ve unhitched and hooked up so the ‘van is warming up as you’re pitching up. Floor carpet can make a big heat-retention difference, especially if you usually only have vinyl flooring. Likewise, filling lockers (e.g. 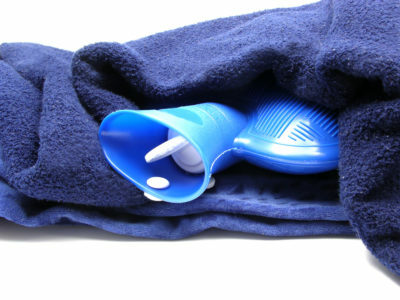 with clothing) will reduce the number of “cold spots”. Wheel arches are where a lot of heat can be lost. Consider adding insulation here if there isn’t any – products like polystyrene or carpet will make a difference. Plus, an old pillow or draught excluder by the ‘van door will keep some heat in. A porch awning will help detract from some of the heat loss you’ll get when you open the door to enter or exit your ‘van. 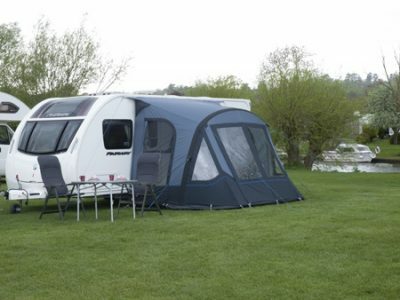 An awning is also a great place to store damp boots and coats and keep wine or beer cold! Pull down blinds and flyscreens, and draw the curtains as soon as it gets dark to keep things a bit warmer. External or internal thermal blinds will also help to take the chill off in a motorhome cab. Don’t forget you can improve things yourself – from using items like hot water bottles, to wearing an extra layer of clothing and a pair of comfy slippers, as well as switching to cold weather sleeping bags or duvets, or simply packing some extra blankets. Remember to never block air vents, even if they are draughty, and in snowy weather regularly lift and shake the mains cable to stop it from sticking to the ground. And don’t forget to fill up the kettle before bedtime so you’re ready to make a hot cuppa for breakfast! Finally don’t forget to get rid of residual water in your caravan or motorhome pipes when you return home and put your ‘van into storage – read our tips on draining down your caravan or motorhome here and of course make sure your caravan or motorhome insurance is up-to-date. very good article and most helpful. Splendid info. We arè newish to caravaning. Already Booked Christmas in one of touring parks in Camebridge therefore was browsing for info winter time.Valuable tips indeed.Someone has advise us to drain pipes and not to use fresh water (sink & shower) at all. Antifreeze in waste tank, I have same idea in mind, however wasn’t sure about fresh water pipes and taps.what about water pump in caravan? Would be safe to use Antifreeze gel for water pump? Wouldn’t do any damaged to it please? Depends on how severe the conditions are Fred. Anti-freeze in the waste tank can be a good idea – or just empty it regularly (especially before night time, when temperatures really drop). Any on-board piping should be okay, especially if you’re in your ‘van and the heating is on etc. If you have a Whale pump here’s their winterising guide – it doesn’t mention anti-freeze: https://www.whalepumps.com/rv/siteFiles/resources/docs/resource-library/Whale_winterisingguide.pdf. It’s a good idea to clean your water system pre-winter to make sure everything is running as smoothly as possible. Very comprehensive, a check list that you can print off would be great. I’m looking at my vinyl floors now, but, mud wins I’m afraid!!! Thanks. Thanks Chris. A checklist is a good idea and one we’ll consider for the future. Good luck with the mud! A good winter extra even if your caravan has heating built in, is a thermostatically controlled fan heater. They can be bought cheaply from the likes ofB& Q.
I have used a cheap one for over 10 years to supliment the van heating. Not all vans over a few years old, are as comfortable as the latest vans!! At low temperatures. I prefer electric to gas at low temperatures. Thanks for the positive feedback Wendy. Glad you’ve found the article helpful. More really useful tips for both the newbies and old hands. Easy to forget some things so will be making up a Cold Weather Check List to add to the others! Thank you. As newbies to motor homing and with a site booked for Christmas, this has been very useful. Thanks Katrina. Hope you have a wonderful Christmas in your motorhome.